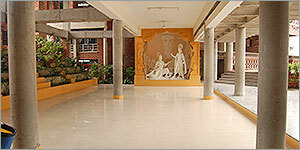 Maa SarAswati Temple - at the entrance of the school. Maa Saraswati showers her blessings on every visitor. 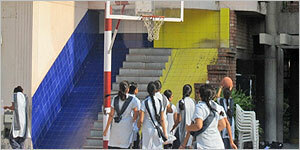 Students enter the premises and first take Maa’s blessings and then begin their day. 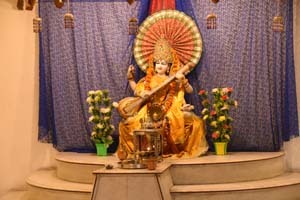 Saraswati vandana is also performed in the temple in the presence of priest. Offices of Chairman, Vice-Chairman, Principal, Manager and Advisor. 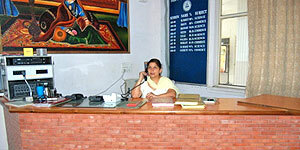 Reception - A greeting and spacious Reception to welcome and clear the queries of visitors. 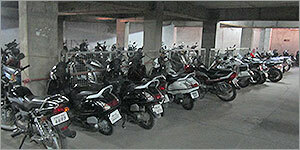 Hari har hall - It is a fully air –conditioned auditorium with approximately 250 seats and with proper audio-visual system. 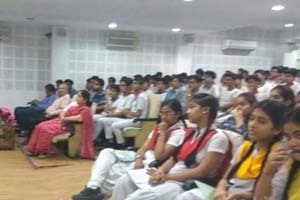 Students are shown documentaries, entertaining and patriotic movies along with power-point presentations. 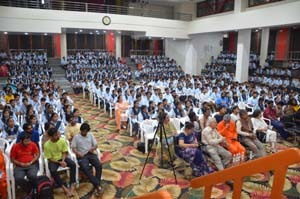 Besides various workshops, conferences and seminars are also held in this hall for teachers and students as well. 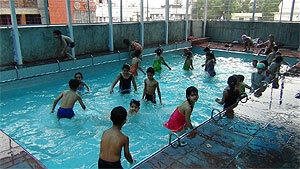 This hall is accommodating and comfortable for each age group because of its inbuilt modest structural techniques. 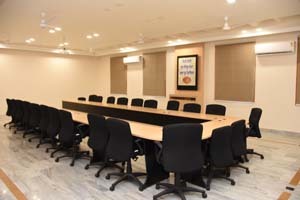 Conference Hall -an air-conditioned trendy hall with capacity of 100 people. 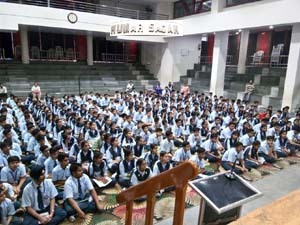 This Hall with the capacity of 100 people, is used by the students and teachers for Group Discussions, Debates, Conversation classes and workshops. Along with aforesaid facilities, administrative block also has the general office with latest equipments to manage the work and a tuck-shop to facilitate students for their time to time needs during school hours. It’s a multi-purpose and multi –facet complex which is used for variety of purposes. It is used for theatre acts, dancing programmes, annual and other functions and many more acts. This complex is built in the beloved memory of Lt. Sh. K.M.Munshi, (founder Bharatiya Vidya Bhavan, Amritsar Kendra). It has hugged Basket ball court, canteen, swimming pool and an underground parking. This complex is always chirped by the giggles and laughters of children in one or the other way. Kailash Vatika - a house of tranquility and serenity depicting Lord Krishna and Arjuna. Placed in Kailash Vatika this spellbound figure is enough to capture everyone. Idols of Krishna and Arjuna seem to endow their blessings on its every pilgrim and give the message of ultimate divinity in this mortal world. This Vatika is used for performing Havan Ceremony everyday and for other creative activities of the students. This is an open sided area with beautiful saplings of plants arranged in a breath-taking and systematic way. Library is the soul of every educational institution. 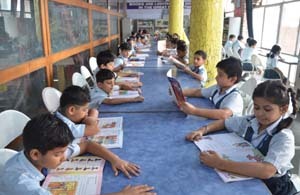 Bhavan’s Library is well –built and offers a large variety of books, journals, magazines and newspapers. It also contains a quantum of books on topics of curriculum as well as general interest and every expanding and crucial issues and topics. The library also facilitates reprographics and computing techniques. Old books are replaced by the new and latest ones accordingly. Kumar Sadan - a multifarious auditorium with contemporary stage and two Badminton Courts. 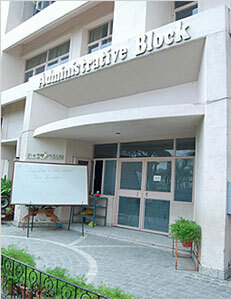 It is a building which entertains many projects of the school. It has in its womb hall, library, yoga room, art and craft room, music and dance room, a fully equipped gymnasium and a recording room. This is used for morning assemblies, prayers, Havans, various stage acts and for other academic activities. 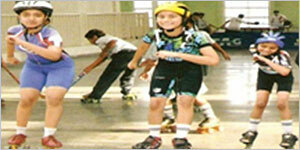 It also provides the facility of badminton court. It can accommodate approximately 1000 students at a time. 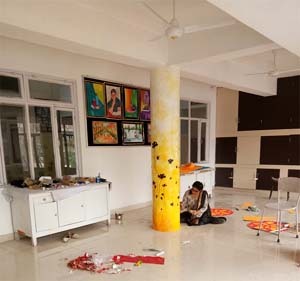 An Art and Craft Room for the students to provide them opportunities in order to make them innovative and give wings to their ideas. Open Air Theatrical Stage - is a three dimensional stage and an integral part of KM Munshi Complex. This complex is a multi purpose complex which includes an underground parking place for 3000 students and the teaching and non-teaching staff of approximately 300 people. It also includes a basket ball court, a canteen , two big performance areas, Underground Office chamber, and a swimming pool for the students. School Gym -a house of Fitness for students and teachers. For physical fitness of students well mechanized gymnasium is built laced with all new types of equipments required for body fitness. 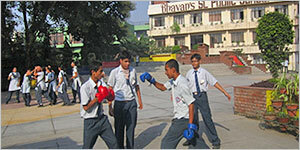 Main purpose is to provide five components strength, speed, endurance, flexibility and co-ordination. 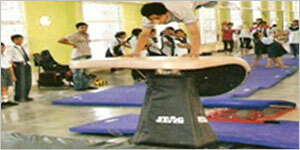 It is meant for students to feel energetic and get all opportunities for their physical growth. Sound proof recording room is built with proper planning. 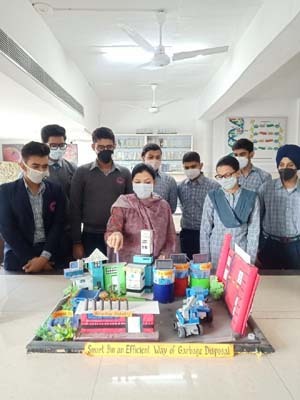 When there is any function, the school artists team including teachers and students does everything on its own like writing, recording, enacting etc. Everything is done by the school and 100% participation is there. To make children’s body abode of fitness and free from fatigue, school also has built Munshi stadium as a tribute to the Platinum Jubilee of Bharatiya Vidya Bhavan and 125th Birth Anniversary of founder K.M.Munshi. 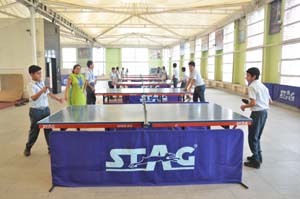 Munshi Stadium -a new fangled area covered with tensile structure which provides venue for major functions and various indoor games like Table Tennis, Wushu, Gymnastics, Judo, Skating, Yoga etc. 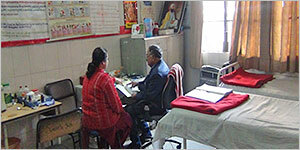 School has a well laid infirmary with a full time doctor to help students at any time during the school hours. Laboratories provide hand on experience to the students with which their learning is geared up and also which needs no lubricants as it is easily absorbed by the brain. Students must be given ample means for the experimentation. Considering this, school has spacious and well-equipped labs. 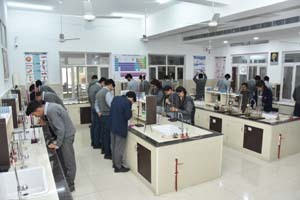 In science labs: Students understand various reactions with their own learning as they enjoy free access to enquiry through latest techniques and equipments. The school also has a Mathematics lab with advanced models and tools. The school also has 2 computer labs with proper networking, battery backup and server facilities. In “Maths Lab and Abacus Lab” the students learn the practical ways of calculating sums and reach to solutions. 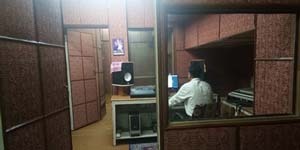 To grasp modern technology well and also make students adaptable to it , school provides the facility of smart classes with ultra-modern techniques to the students; Audio-visual methods leave the inerasable traces on child’s memory and give strong backup also. 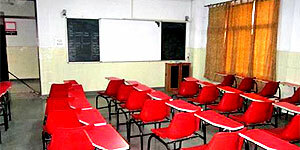 Besides, such classes make classrooms lively, interesting and enjoyable.